many boaters to the ZX line. The result is a truly fascinating combination of an open-air bowrider with ZX muscle. of 80 mph. ensuring that youll completely leave everyone else in your wake. plants with up to 754 horses, the 28 ZXO pushes the boundaries of speed and performance. 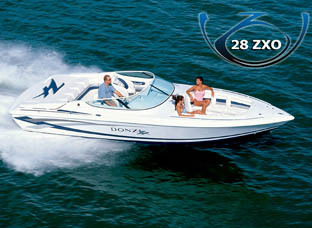 Entirely devoted to optimizing your boating pleasure, the 28 ZXO is fast, agile and responsive to commands. This boat is a winning combination of comfort, reliability and quality. Every item in the 28 ZXO, from the bold graphics to the deep-throated rumble of the naturally aspirated engines, shows Donzis commitment to building the biggest, fastest, best-performing boat on the water. This boat takes Donzis dedication to a new level. It makes a bold statement in style and functionality. And for those who are seeking the maximum enjoyment from an open-bow boat, this Donzi clearly delivers the best of all worlds.